Matt and I would like to thank you for an absolutely wonderful evening. Energy, class, and elegance were exactly what you provided. October is almost here, and the changing leaves and cool weather have us thinking of Halloween and how much fun these seasonal weddings can be – especially with the holiday falling on a Saturday this year! From touches of orange to a gown with ornate, black detailing there are so many ways to add a spooktacular touch to your nuptials. 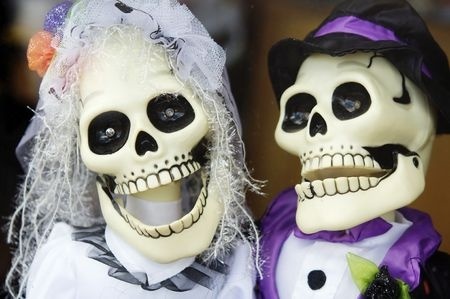 Whether you are a bride looking to stray from the white dress norm or are interested in adding a pop of bright color to your big day, Halloween is the perfect time to do so. In recent years, black wedding gowns have become a fashion-forward alternative to the traditional white gown, providing you with plenty of options to choose from. Every bride deserves to feel beautiful and confident on her wedding day, so choose the dress that speaks to you, regardless of its color. Looking for a more subtle homage to the holiday? Pumpkin colored ties and bright orange bouquets are two great ways to incorporate some spooky spirit. One of my favorite ideas: A pumpkin basket for your flower girl to carry. Orange flower petals or dried leaves in shades of spice and burgundy with look stunning on the aisle. From your save the dates to the wedding cake, there are so many little touches that can be added to your event. Touches of orange throughout the venue, glowing jack-o-lanterns and themed décor are some of our favorite ideas. Vintage candelabras and cobwebbed branches will add to the bewitching fun. Add a unique spin on the popular cookie table and create a candy buffet instead! Choose all your favorite chocolate treats and let your guests fill goodie bags to take home. Set the mood with a dance floor that looks like it came straight off the set of Michael Jackson’s “Thriller” music video. Smoke machines and mood lighting paired with Halloween hits like “Monster Mash” and “Ghostbusters” will have your guests on the dance floor in no time. There are so many fun and unique ways to incorporate Halloween into your October wedding. Make the day your own with these ideas and enjoy the haunted fun!